If you don’t have a poncho yet, then you should buy it as soon as possible. But why is this piece of clothes so necessary? First of all, it is a great addition to any outfits from elegant and chic combinations with pencil skirts and ruffled blouses to relaxed ones with distressed jeans and oversized sweatshirts. And, secondly, this item is perfect for a transition period from a warm to cold weather. 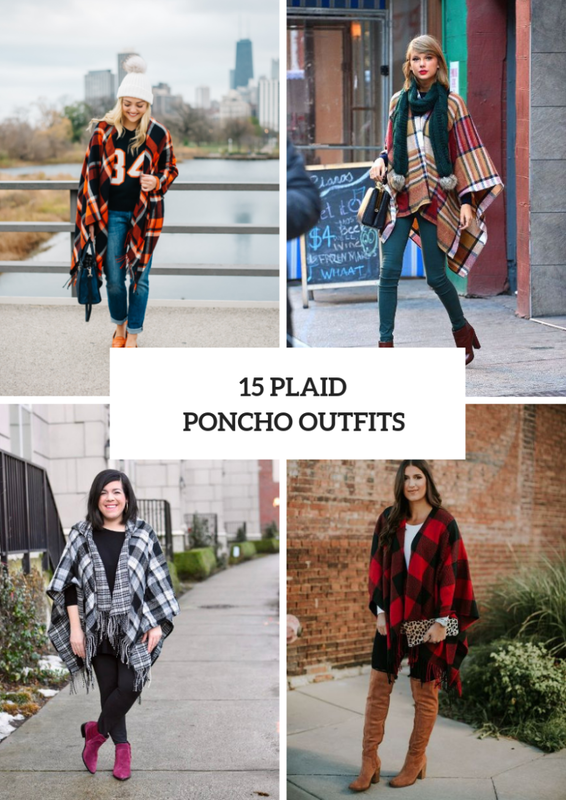 Today I’d like to pay your attention to outfits with a plaid poncho, so these ideas will help you to create awesome looks for an every day and Christmas holidays with your family. Now I offer you to scroll down. 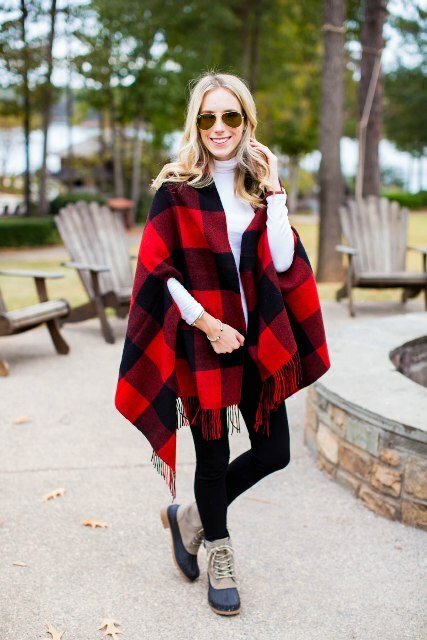 If you want to make a sporty styled or relaxed outfit, then you can take a gray loose sweatshirt and combine it with distressed skinny jeans, rounded sunglasses, black flat shoes and a plaid poncho. 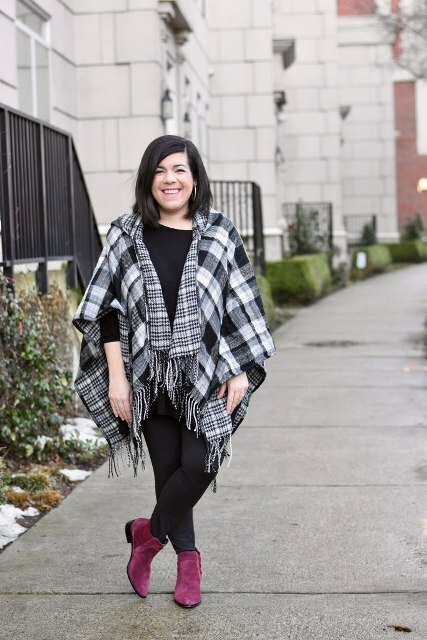 Or you can choose a black shirt and mix it with black skinny pants, a black and white checked poncho and purple suede ankle low heeled boots. For colder days you can add a cute white beanie with a fur pom pom to these looks. 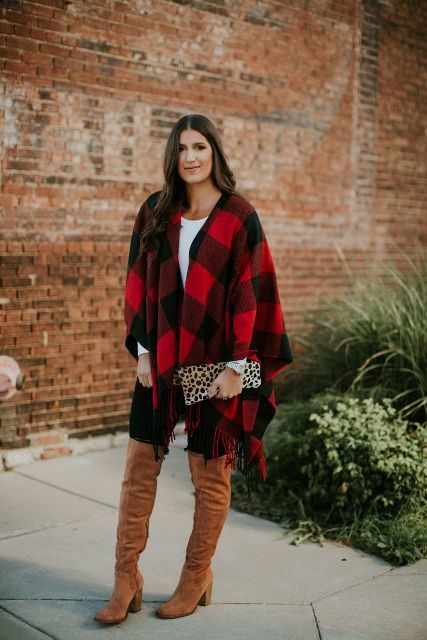 For creating a more chic outfit you can try to repeat a combination with a marsala and navy blue plaid poncho, a mini skirt, a black leather tote, knee high socks and marsala patent leather high flat boots. Wanna look taller? Then, of course, you need to choose high heeled boots. For example, you can pair a shirt with emerald skinny pants, an emerald scarf with fur pom poms, a small bag, marsala high heeled ankle boots and a mustard yellow, red and dark green poncho. Or you can take a green and white poncho and combine it with skinny jeans, a red leather bag and black lace up boots.